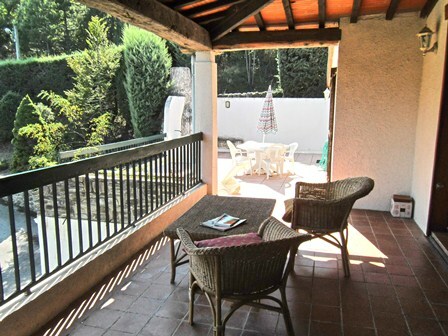 The Accommodation - comfortable, well equipped holiday villa apartment with stunning views. Springtime view from the terrace, looking over the top of the mimosa tree towards the village of Vernet Les Bains. Equipped to a high standard, this comfortable apartment, set within large communal gardens, has superb views from the terrace. Entry is into the hallway, from which most of the other rooms are accessed. Immediately to the right is the sitting / dining room, with views through patio windows, on to the large, sunny terrace & the Canigou beyond. This room contains a six-seater dining table, several comfortable chairs, a sofa, satallite television & radio/CD/cassette player as well as a large & well-stocked bookshelf with an eclectic book collection. Off the dining room is the well-fitted kitchen with plenty of work-surfaces, fridge-freezer, oven, hob, microwave, dishwasher and electric kettle. There is also a dining table. Conveniently, the kitchen also has patio doors leading straight onto the terrace. This large, sunny terrace has plenty of space for dining alfresco or simply soaking up the sun & the view (not to mention the local wine). There is a built-in BBQ & adjacent marble sink. Also leading from the sitting room, up 2 stairs, is the main bedroom. This room is large and comfortably furnished with a double bed and futon. This room has wooden floors and patio doors leading onto the covered terrace. From the other side of the hallway, a door to the left leads to a bedroom equipped with bunk beds. This room has patio doors out on to a pleasant patio with flower borders. Further along the hall, again on the left is the bathroom, with bath, shower, wash basin and toilet. Next to the bathroom is a separate toilet and hand basin. At the end of the hallway is a further large bedroom, carpeted and comfortably furnished with twin beds. This room has a lovely view of the mountains, particularly at sunrise. The apartment has central heating, and Wifi. Below the apartment is a cave containing a washing machine & tumble dryer, with lots of storage space for bikes, skis, etc. For Families: A Cot is available. There are some toys (3 small boxes for different age groups), several board games, table football and even a set of boules for petanque! A garage is available by request.